Update: Here are the results from the MythBusters NASA Moon Landing Episode. On August 27, 2008, The Discovery Channel will air a new episode of MythBusters entitled “NASA Moon Landing”. This episode was created to challenge the wild but persistent urban legend that NASA never really landed humans on the moon in the 1960s and 70s. This special episode was first announced on NASA TV in February of 2008. To film the episode, Adam, Jamie, and the rest of the MythBusters cast chose to visit the Marshall Space Flight Center in Alabama. A team of Marshall scientists helped the MythBusters with several of their tests. 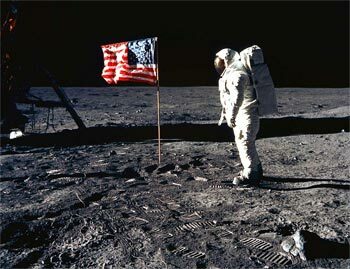 Proponents of the Apollo Moon Landing hoax conspiracy theories insist that NASA and the US Government intentionally deceived the public by fabricating the manned moon landings. Although exact details from the episode are mum, NASA has reported that the MythBusters’ tests included a feather, a weight, a lunar soil boot print, and a flag in a vacuum.